The 2-hour Transformation Circle seminar/workshop happens every Saturday and explores various topics such as Relationships, heart break, anger issues, parent issues, manifestation, abundance etc. We use tools like EFT, NLP, Inner Child Work and Energy Healing in these sessions. Learn EFT (Emotional Freedom Technique) and how to use it for self and others. Unhealed or stuck emotions are the core reason for various problems in life from health issues to relationship and financial problems. Emotions are the least understood and badly dealt with aspect of human life, yet it is one of the most important reasons behind major life decisions. Patterns that we live in life are stuck to us because of unhealed emotions associated with them. Patterns can be defined as repeated similar situations happening in a person’s life – whether its about being back stabbed, or being sick, or being broke financially – we keep getting stuck in similar situations again and again because we are emotionally blocked. The only way to create any positive, real and lasting change in life is to heal the unhealed emotions still stuck in our system and learn how to create new and better systems or habits for ourself. EFT (Emotional Freedom Technique) is a path breaking technique which is an amalgamation of Ancient Chinese Acupuncture and Modern Psychology. It works on the energy system of the body and releases stuck energy and emotions in a non-invasive manner. This technique is being used worldwide by professionals from different fields for health, wealth, relationship healing and spiritual growth. Along with EFT, you will also learn how to help others progress in their personal growth journey using advanced tools like Inner Child Healing, processing emotions, parts and shadows. Besides this, you will also learn how to work in a coaching environment, becoming a successful and effective coach; you will learn the techniques and process of coaching someone, helping them heal their life and create a better one. In Level 1, you will learn the basics of EFT and how to use it effectively for healing emotions, memories, past traumatic events, limiting beliefs and addictions. You will also learn how to work with others, how to uncover the deeper issues and heal them. Healing the emotions is the core in any personal growth process. To heal your life or to become an effective coach for others, you need to learn the basics of emotions and how to handle them and heal them. Once you have mastered the basics of EFT and emotional healing, this level takes you deeper into the human psychology of why we do what we do – why we behave in the way we behave, what are impulses. You will learn about anchors and triggers, how the mind works, core needs of a human and how they affect us on a daily basis, meaning of therapy and how to work with clients and yourself. You will learn tools like Inner Child Work, Shadow Work, Parts work, working with Energetic cords, grounding etc. to help yourself or your client to heal from within, release the self sabotaging blocks and grow in life in a positive way. Meetu Sehgal, Personal Transformation Coach, EFT Trainer, NLP Practitioner, Tarot Reader and Holistic Healer, is Masters is Psychology and MBA graduate from SRCC, Delhi University. Since the last 7 years she has been passionately working with individuals helping them heal health, wealth and relationship challenges. Through her training and coaching sessions, she helps motivate her clients to manifest a certain richness in their lives. Abundance is a natural state for us. Lack of abundance means there is a block in us that is not allowing us to receive abundance. It could be negative beliefs about money, discomfort with receiving, deserving issues etc. In this session, we will explore the blocks, how to uncover them and release them so you can receive and attract abundance in every sphere of life easily and effortlessly. Reiki Master is a 2-Day intensive workshop that initiates you into Reiki Mastership. It introduces three new Master symbols, advanced meditations, psychic surgery, crystal grids and much more. Reiki level 1 and 2 initiation is mandatory for this course. ​Archangel Michael is the protector and leader of all angels. He is in charge of overseeing that all the angelic work is being performed without disruption. He is also known as the “chief messenger” of God who is in charge of the first ray of protection and faith. Among all the angels and the angelic world, he is the most known and loved angel whose presence has been known and felt always. He protects us, our spiritual work and practice, our physical belongings and safety. He also guides people in their life’s mission and purpose. 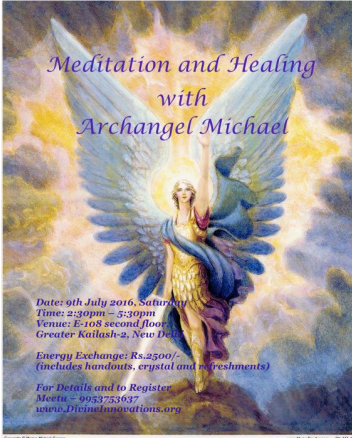 In this 3-hour workshop, you will get to know and work with Archangel Michael much more closely. In the 2-day Transformation Circle Workshop, we go deeper and help you resolve the root cause of conflicts (emotional blockages stuck in deep subconscious) and empower you with the tools and techniques to create healthier and more fulfilling relationships. In these 2 days, we will guide you each step of the way through our EFT, NLP & Energy Healing based program that goes to the core of the issue and heals the emotional anchors so that are freed from the years of conditioning and repetitive patterns. 4 Take your power back so that you can move from being a victim to being empowered to make your own choices. Conduct a quick and effective process to ease the emotional block with a person and have emotional stability and mental clarity to deal with the situation. Heal the root of all emotional (core memory) turmoil to create a clean slate to build newer healthier experiences for relationships. Build an inventory of positive skills and tools that you can use to create the life you want. Meetu Sehgal, Personal Transformation Coach, EFT Trainer, NLP Practitioner and Holistic Healer, is Masters is Psychology and MBA graduate from Delhi University. Since the last 7 years she has been passionately working with individuals helping them resolve health, wealth and relationship challenges. Manu Panicker is an NLP & EFT Practitioner and coach, and has been in the field of personal growth for the past 13 years. Started his career as a Personality Development Trainer in DAV Institute of Management, he has worked closely with people helping resolve career, health and relationship challenges. Being in the core field of learning and execution, he is into training golfers on the Mental side of golf. We invite you to the Transformation Circle where each session focuses on healing an aspect of your life – health, weight loss, relationships, attracting the right partner, career, finance, releasing fears, stress, physical pain etc. Each session is focused on a particular theme. As a unique and fluid session, the energy (concerns) of the participants sets the direction and the tone for the group. As we explore different areas/concerns around that theme, we work on healing and resolving them using tools like EFT, NLP and Energy Healing. Weight gain comes with a host of issues like low self esteem, relationship challenges, health concerns etc. The struggle to lose weight can seem like an uphill task with disappointments and failures that can take its toll on the emotional health as well. Weight gain can be due to various reasons – diseases, food addictions, stress, emotional reasons, unhealthy lifestyle, genetics and so on. Each underlying reason has its root in negative emotions, self-sabotaging beliefs and sub-conscious blocks that can stop you from achieving your health goals. These sessions specifically look into removing negative emotions, beliefs and blocks and creating positive beliefs that help you achieve your goals and sustain a healthy lifestyle. Meetu Sehgal, MBA graduate from Delhi University, is an EFT & Matrix Re-imprinting Practitioner, Reiki Master, Tarot Reader, NLP Practitioner, Breakthrough Coach and has a background in counseling and training. With more than 8 years of experience in Tarot Reading, she is known as “Tarot Healer” for her in-depth tarot counseling sessions. She is the founder of “Divine Innovations – Institute of Healing and Transformation”, and is currently also working with Fortis Escorts Heart Institute in the department of Psychology. She actively writes for e-magazines, magazines and newspapers like Dainik Bhaskar, Future Samachar, Research Journal of Astrology etc. She runs her own e-magazine named “Kaleidoscope” which provides a platform for a writer hidden deep within everyone. She conducts one-to-one counseling sessions as well as workshops and training seminars. This is an Emotional Well-being Seminar where you get introduced to Emotional Freedom Techniques (EFT). This technique is clinically proven to lower stress, anxiety, tension, cravings, negativity, fears, confusions, traumatic memories and phobias, creating health, wellbeing and happiness. Magnified Healing is an Ancient Healing Modality that was introduced to Earth in 1983. Previously, this healing was used only in higher dimensions by Ascended Masters to assist themselves, the Masters on Earth and mankind under special divine dispensation. In 1992, under the direct intervention and inspiration of Lady Master Kwan Yin, Magnified Healing of the GOD MOST HIGH OF THE UNIVERSE was brought forth into its expanded form for the spiritual advancement of humanity and the earth. Tarot is an ancient art of foretelling future. Over the years it has proved to be an immensely useful tool for counseling and guidance. A pack of 78 cards can be an excellent guide and friend when you are faced with decisions and confusions. Attend an Emotional Well-being Seminar and get introduced to Emotional Freedom Techniques (EFT). This technique is clinically proven to lower stress, anxiety, tension, cravings, negativity, fears, confusions, traumatic memories and phobias, creating health, wellbeing and happiness.